Jess Varnish and Katy Marchant finished fifth in the team sprint at the World Championships. 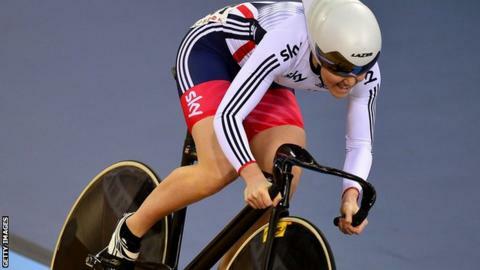 Jess Varnish says she hopes to regain her place on the Great Britain cycling team for the 2016 Olympic Games. Sprint rider Varnish, 25, was dropped in April after failing to qualify in the team sprint for the Rio Games through the World Championships. She later said she was the victim of sexist comments from technical director Shane Sutton, who has since resigned. "I maintain that I am a world-class athlete and have the ability to win more medals," she said. Australian Sutton, 58, has rejected accusations of using sexist and discriminatory language towards elite cyclists. Varnish (front) and Victoria Pendleton broke the world record in qualifying in the team sprint at London 2012 before being disqualified in the semi-finals. Varnish said she plans to meet new GB performance director Andy Harrison when she returns from training in Australia. She also said she had spoken with British Cycling and UK Sport, offering her full support in their respective investigations into allegations of sexism in the sport. qualified for the Olympic places for Great Britain in the individual sprint and Keirin. She added: "I still maintain that the decision not to renew my contract was not down to performance. "Prior to the 2016 World Championships, I was not once told that I was underperforming. "The first I knew that the coaches had an issue with my performance levels, or training data, was five days after the 2016 World Championships, when I was told I wouldn't be getting a new contract over the phone. "It has been a dream for me ever since London 2012 to compete and be successful in Rio."